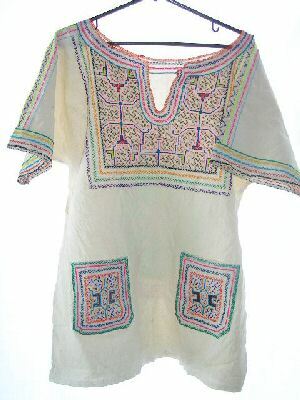 Hand embroidered shirt in the typical Shipibo design with embroidery on front, back and sleeves in 100% unbleached cotton. Tags: hand embroidered puruvian shirt, peru shirt, Peruvian shirt, shipibo embroidery shirt, shipibo shirt. The shirt is hand embroidered both front and back with a wide variety of stitches. The front has a hand embroidered V neck trimmed with a blanket stitch. The frontice piece measures 13 1/2″ X 14″ of hand embroidery in beautiful Shipibo design. The sleeves are also trimmed with embroidery. On the back of this shirt is a 13″ diameter circular panel of hand embroidered art. Four straight chain stitch spines radiate from a tri-circle center, dividing the circle into eight pieces of traditional twisting Shipibo art. This is not only wearable art but frameable art. One of a Kind, it is a 100% unbleached cotton shirt. Shipibo design is a mixture of geometric patterns. Although the meaning of the designs has been lost, anthropologists theorize that the designs could be a form of language, or that they represent the twisting rivers and canals. The Shipibo design seems to be a communal art as one woman could stop her work and another could continue with no disruption in the pattern. This is truly wearable art. Hand wash with a gentle cleanser. Line dry and steam iron lightly as needed.